So, a few months ago, somebody on You Tube contacted me asking if my original series "Conquering Tide" was based on or inspired by Erin Hunter's Warriors series. I created the plot for Conquering Tide around 3 years ago, and I'd never heard of these "Warrior" books. So, as a research project, I thought I'd see what the fuss was about. I finally bought the box set of the first 6 books about a month ago, and I've almost finished "The Darkest Hour". All I can say is, what a great series! Thoroughly engaging! I can see similarities between my series, even though of course I'd never heard of them at the time. So, inspired by "A Dangerous Path" where Bluestar has lost her way, and has lost faith in her clan members and even Starclan itself. Of course, Fireheart is always concerned for his noble leader. So this a pen and watercolour drawing depicting my interpretation of the characters. This is beautiful! The colours are amazing, and the expressions are brilliant! Firestar is my favorite warrior cat. c: You should start on the next series, "The New Prophecy"
I think that is... A-M-A-Z-I-N-G! You should read the other 3-4 warrior series when you finish the first one! i never knew u liked warrior cats! in my warrior cat character im Seafang! because of this picture, I've begun reading Warriors. This is so deep and intriguing, and really reflects the essence of the novels. beautiful work. It's the best series ever! I have read each book TWICe!!! Could I use this in a Youtube video? I will give credit! Holy awesomness!!! i love it!! You made Bluestar look so pretty!! Love how you did them.CMM,i have to admit,you should be IN AN ART TALENT SHOW!I mean,your art would truely win! Cinnamon Mew Mew you should read the other book there are 40 other books (I have read and own all of them O-O) they are VERY good! 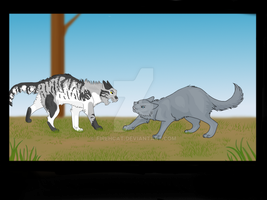 OMG Warrior Cats are the best series I have ever read. Sadly I read the last book of the ENTIRE Series, so there are no more adventures. But I am looking forward to reading the newest special addition book, Yellowfang's Secrect. Yellowfang is my ultimate favorite cat. I do have another one, but I won't spoil him for you. (Dang you replied fast...!) But anyways. I KNOW RIGHT! MY warrior cat, Rainbowpelt, is mostly based off of Yellowfang. Despite a few things. I love it and I'm glad you're reading Warriors! The plot gets a whole lot more complicated as the series goes on, especially when you figure out who is related to who, though it doesn't always tell you in the book. Woah, this is great! The expressions are depicted very well, any the textures look wonderful! AHHH!! I LOVE the Warriors series! I'm glad you're reading them! Awesome! That's totally how I imagine Bluestar and Fireheart. Hmm... I guess I never really thought about it but I guess I see how some people might think CT had been a little Warriors inspired. First sub-series is the best in my opinion btw Just saying. this looks exactly how i imagine them! awesome! llama badge for you! Wow... This picture is beautiful!! I'm glad you discovered the series, and I hope you like it. Bluster is a truly epic character, I must say. She is indeed epic. I was rather teary eyed at the end of A Dangerous Path. Me too. She's probably my favorite ThunderClan leader. I'm glad you enjoy the series! AMAZING I love warrior series. and the detail is amazing. IKR?!? I love this series! Bluestar was my favorite! Nice job drawing them! I love Bluestar too. I'm also strangely rather partial to Yellowfang. So, she'll be the my next attempt! That'd be great! Wait. I haven't checked out your YouTube for a while. Are there any moar new Episodes??? Just wondering.